Stearic Acid 16 Oz (Triple Pressed) by SpirZon LLC at Designers Artists. MPN: FGSTAC16. Hurry! Limited time offer. Offer valid only while supplies last. Stearic acid is naturally occurring fatty acid that is a waxy solid and comes in forms of flakes or beads (form does not affect product's quality). Plant derived ingredient, suitable for vegan and natural/green homemade cosmetics recipes. Use it for soap making, candle making or homemade body butters/lotions. 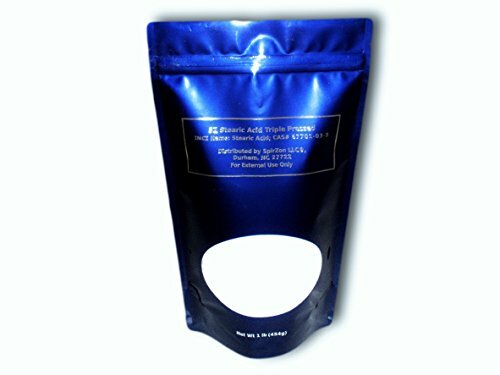 Comes in convinient re-sealble stand up pouch. Easy to use, easy to store. If you have any questions about this product by SpirZon LLC, contact us by completing and submitting the form below. If you are looking for a specif part number, please include it with your message.